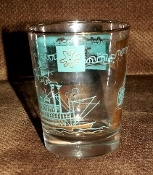 This is a wonderful 1950's Libbey Turquoise Gold Showboat Set of 4 Fourteen Ounce Tumblers. The Glasses feature turquoise and gold Showboats, an atomic squiggle serving as the smoke from the showboats' stack and a alternating gold and turquoise retro flowers centered in reverse colors. The Libbey Southern Comfort Showboat Fourteen Ounce Tumblers have a heavy gold rim which adds to their charm. A wonderful addition to your Eames Era glassware collection! The Libbey Southern Comfort Showboat Fourteen Ounce Tumblers have no chips or cracks. The glass is sparkling, the graphics clear and crisp. There is no wear to either the turquoise or gold. The Libbey Southern Comfort Showboat Glasses stand 4-1/2 inches in height, measure 3-5/8 inches in diameter at the top,2-3/4 inches at the base. The glasses have the Libbey script "L" impressed on the underside of the base.